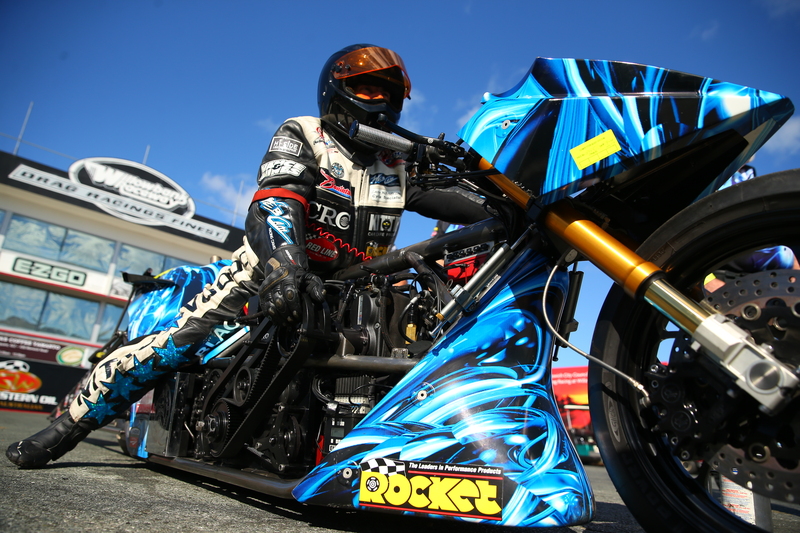 Australia’s current Number 1 Top Fuel Motorcycle Champion Chris Matheson and his Nitro Voodoo Team are making final preparations for the Nitro Up North season opener in Darwin later this month. Matheson said he was eager to continue his good form from last season, where he led the six round Championship from start to finish. Matheson said he was looking forward to the 400 Thunder Championship Season opener, the Hidden Valley Track is a good one on the circuit and the event attracts a huge crowd. The State Government and Local Community get behind the event and support the racers and their Teams, making us all welcome. We have raced there in past, however, it didn’t end well a couple of years back. Unfortunately, during the first elimination run we blew a spark plug out of the Cylinder Head at quarter track, which hit me in the chest, pumping 45,000 volts (44 amps) through my body. The shock blew my hands of the handle bars, sitting me up on the bike at 150mph, which nearly resulted in me being blown off the bike. Eventually, I got the bike stopped and was taken to Darwin Base Hospital, where I spent some time in the ICU. The Bike is set to go, fresh off the back of the rained out Winternationals, where we Top Qualified with a 6.18 second pass. We have been testing new engines and combinations over the last season and hope to improve our National Record of 6.04 at 241.8mph (389.1kph) throughout the 2017-2018 Season. The trek North to Darwin from our Brisbane base is a long haul in the transporter, however, an enjoyable one at this time of the year. We only travel during the daylight, as night wildlife can be dangerous, Kangaroos, Camels, Pigs, Donkeys and stray cattle feed at night during the cooler hours and tend to graze on the roads edge. We normally clock around 12 hours of driving each day, which gets us to Darwin in around four days, all going well. We have a full field entered for the event, with riders coming from all over Australia, so it will be very competitive. The 400 Thunder “Nitro Up North” event will be held Friday 21 – Saturday 22nd July at Hidden Valley Drag Strip, Berrimah, Northern Territory.